I could see them from 50 yards away. They were calling my name. My heart fluttered a bit and my eyes widened. I pulled into the roadside market and there they sat, huddled together in gorgeous creamy white piles. White pumpkins, hundreds of them, big and small! Ahhh, now this beautiful site says fall to me! Thankfully, I actually had cash on hand … a rare moment with 4 kids. The little sales girl eyed me curiously as I gathered up a whole slew of those little beauties, giggling and smiling ear to ear, like a kid in candy shop. 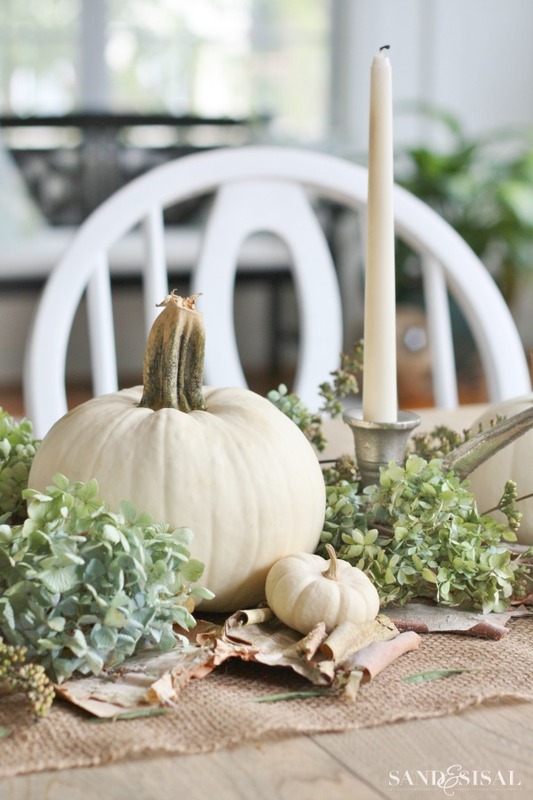 It was time to head home create a gorgeous White Pumpkin Centerpiece for the kitchen table! Autumn in coastal Virginia is gorgeous. We tend to ease into fall more slowly though than other parts of the country because our weather is so warm and the leaves don’t even change until late October. 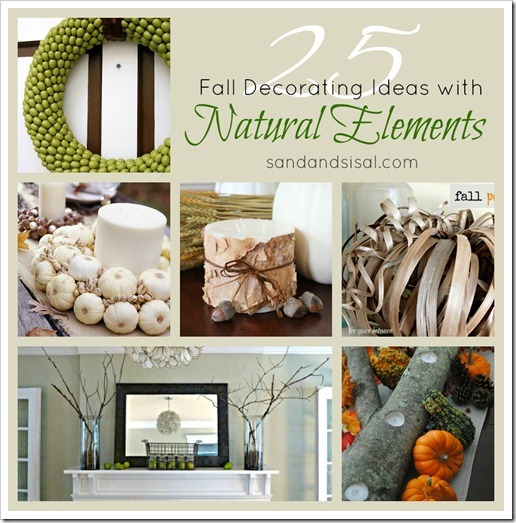 I love decorating with natural elements as much as possible. Why, you might ask? Well, because it’s free (yay!) 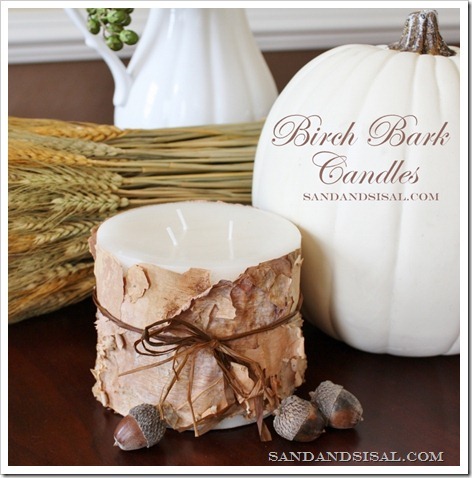 and I feel it creates a very relaxed and comfortable atmosphere in your home. The antler craze has been going on for a few years in decor and to be honest I haven’t exactly been a huge fan, especially real antlers. But I came across two silver antler candelabras at TJMaxx/Homegoods the other day and knew they would work well for both fall and Christmas. 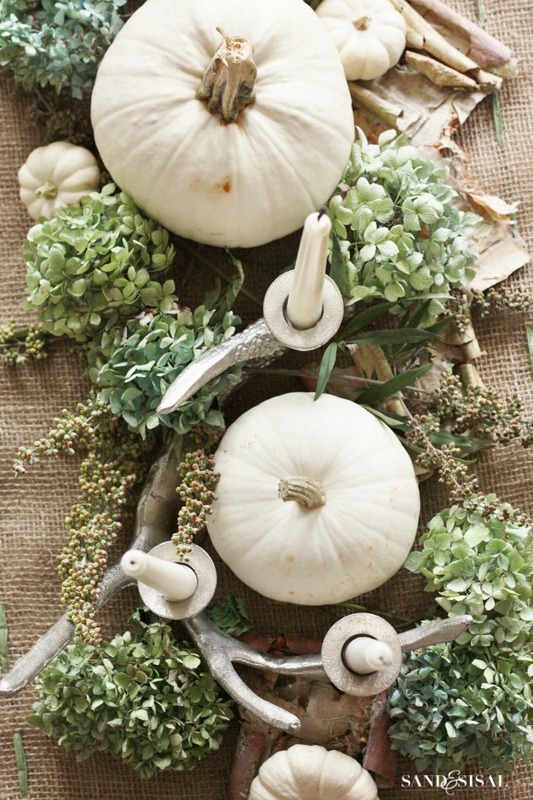 The pumpkin centerpiece is simple comprised of the 2 silver antler candelabras, white pumpkins, dried hydrangeas, birch bark, and chasteberry tree branches. All of the natural elements came from the back yard. 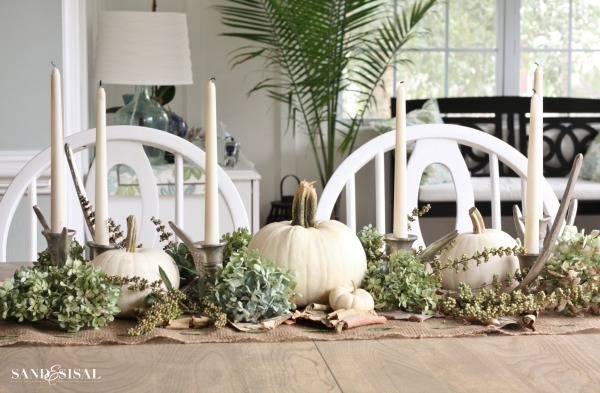 The white pumpkin centerpiece is arranged on top of a super simple and easy to make burlap table runner. You can buy rolls of burlap at Michaels Craft Stores. I cut the length I needed and then cut 2 equal lengths of sage green raffia. 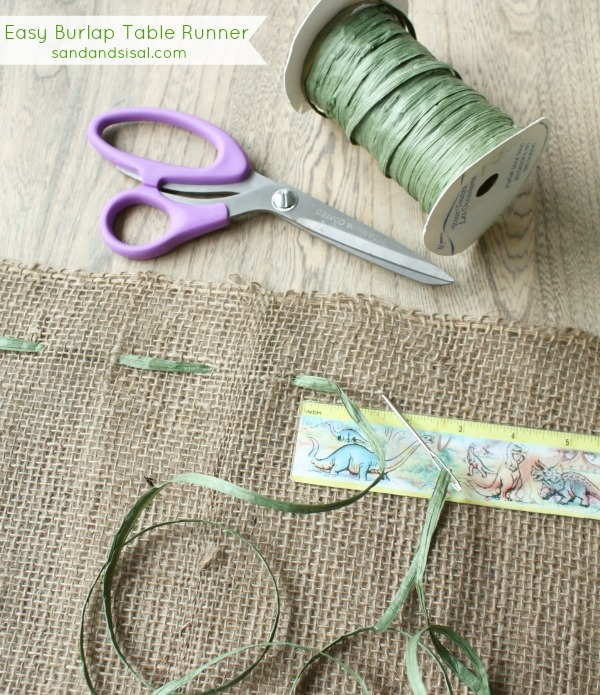 With a large needle I stitched the raffia through the burlap, using a ruler to keep the stitches about 1.5″ apart. 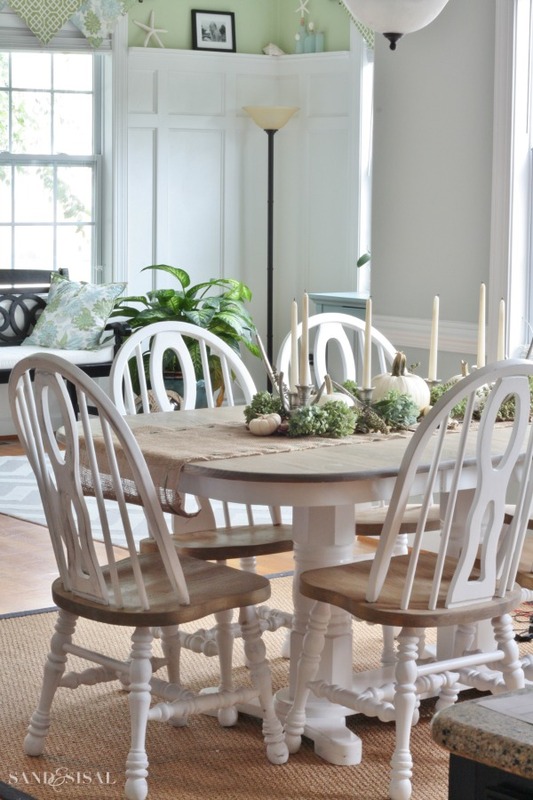 The green raffia gives the table runner just a little extra detail. You could do this with any color of raffia or skinny ribbon. It is very inexpensive and doesn’t take much time to complete. Tall taper candles lend a sense of elegance to the centerpiece. Tapers are coming back into popularity once more. 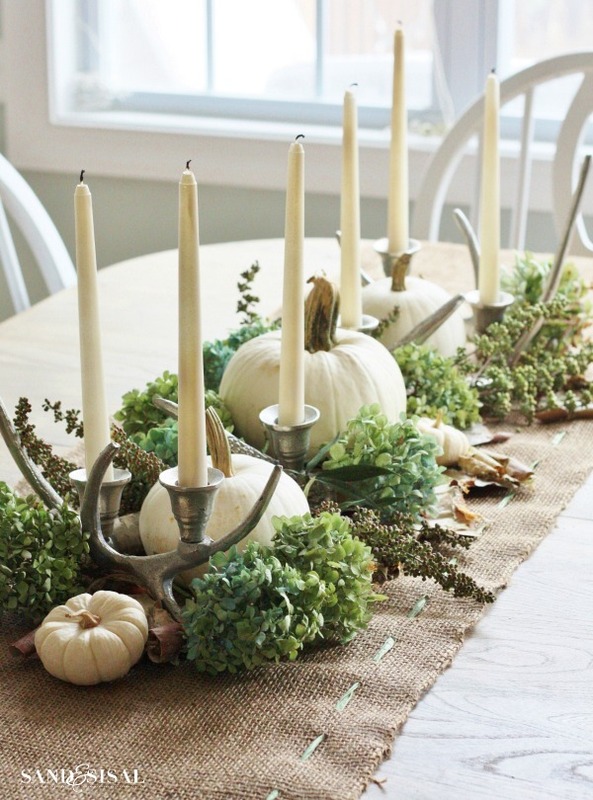 My mother always had our table decorated with tapers and a centerpiece. It made the even the most casual family dinners extra special. 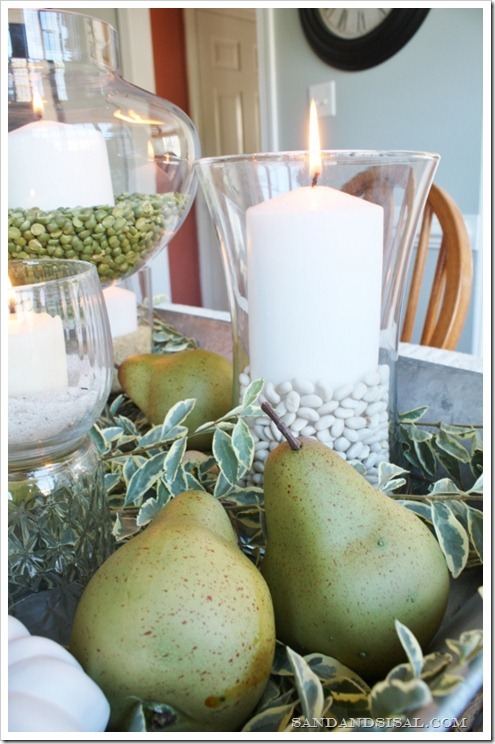 All I had on hand though were white taper candles and they looked to stark white next to the creamy colored pumpkins. So guess what I did? I spray painted my candles! Did you know you can spray paint candles? I sprayed them in Antique White. Perfection! 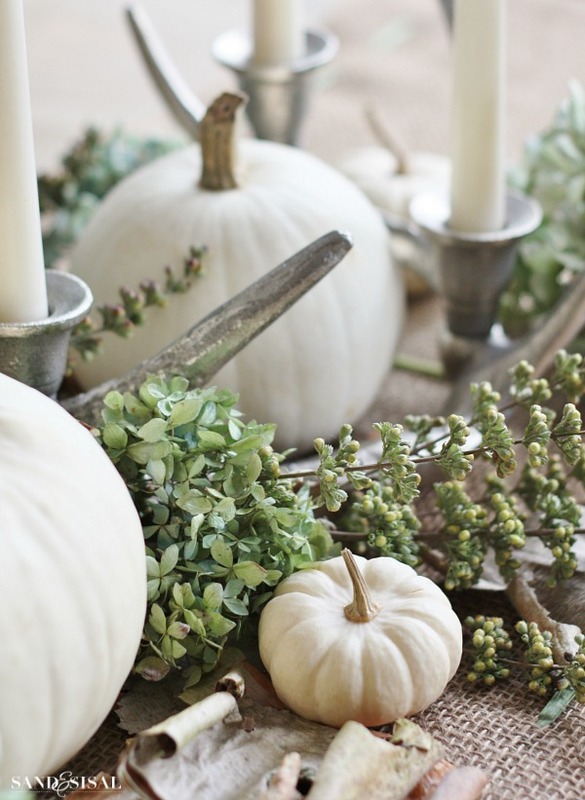 I absolutely love the soft greens and subtle blues of the hydrangea and chasteberries look paired with the silver antlers and creamy pumpkins and all the texture of the birch bark and burlap. BEAUTIFUL! This neutral decorating for fall theme has been extended into my living room and mantel which I’ll show you later this week. i love this, kim! what a perfect mix of elements! Kim that table and your pumpkins are just gorgeous! Love that stuff from your backyard! You need to package it and sell it lol! I want some! It’s all beautiful! Happy Fall! Awww, thank you so much Debi! Such a pretty centerpiece. I love the silver antler candleholders, such a nice combination of a natural feeling contrasted with the silver color. So very pretty! Those white pumpkins send me aflutter too!